July 7 is Independence Day in Solomon Islands. This public holiday commemorates the independence of Solomon Islands from the United Kingdom in 1978. Solomon Islands is an island country in Oceania. Much of its territory is formed by the Solomon Islands archipelago, but the country should not be equated with the archipelago. The first Europeans to visit the islands were the Spanish in 1568. Later, the archipelago was visited by British, French and Dutch navigators. In June 1893, British Solomon Islands Protectorate was declared over the southern part of the archipelago. Following the Second World War, official local councils were established on the islands. This enabled participation of the islanders in central government. 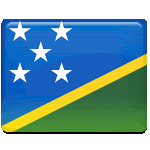 The first elections in Solomon Islands were held in the 1960s. In 1970, a new constitution was adopted. It replaced the previously existing Legislative and Executive Councils with a single Governing Council. After the 1973 oil price shock British administrators realized that the financial cost of running a colony increased too much. In 1976, Solomon Islands were granted self-government. On July 7, 1978, Solomon Islands became an independent country.